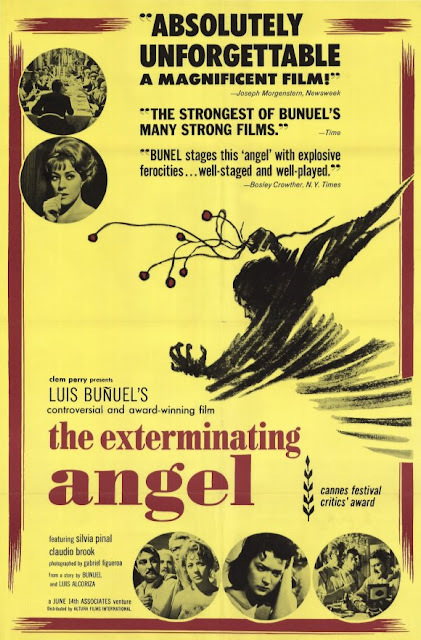 Infinite Art Tournament: The Great Movies: "The Exterminating Angel"
The Great Movies: "The Exterminating Angel"
We've encountered Luis Buñuel twice before in this project, in the punkish 1929 experimental film Un Chien Andalou and in the fairly grating 1976 drama Belle de Jour. The guy had a crazy long career. Having seen these two films, though, I had to approach The Exterminating Angel not only not knowing what it would be about, but also not knowing to what extent it would be about anything at all in the conventional sense. It turns out, though, that The Exterminating Angel is a movie with a fairly straightforward narrative. The plot is based on an absurd premise, but no more so than in any film with a science fiction or supernatural element to it. It has surrealist elements reminiscent of Chien Andalou -- a trio of sheep shown wandering around an upper-class home with no immediate explanation, for example -- but they turn out to have both reasonable rationalizations for their presence and a role to play in the plot. The disembodied hand from Chien comes back for a cameo, but this time it is there for a conventional reason: it is a hallucination brought on by starvation and stress. The Plot: As a group of rich folks gather for a party after the opera, the servants feel a strange compulsion to leave the house. The party goes on until very late in the morning, when the guests all announce their intention to leave. But no one actually leaves; they all find reasons to just go to sleep in the parlor where the party has been. The next morning, it begins to dawn on them that some mysterious force is preventing anyone from leaving the room. They can walk toward the open doorway with every intention of leaving, but somehow their mind will change before they reach the threshold. The hours, then days, then weeks go by, the party-goers struggling first to leave, then merely to extend their survival. Ebert suggests that this plot is a commentary on the privileged classes in Franco's Spain who, having seized control of their country, ironically trapped themselves in a stagnant society that no greater vision than the mere continuation of its banal status quo. I can buy that. My own thoughts drifted towards the parallels between Angel and a later movie with a radically different tone, the 1993 comedy Groundhog Day. Both feature protagonists inexplicably trapped in either time or space, and use their altered realities as a laboratory for a thought experiment in morality. What sort of temptations and challenges would face people placed in such extreme circumstances? How would they confront their situation? And what can we learn from their hypothetical choices that applies to existence in realtime? In both cases, the thought process is worked out in an engaging and entertaining sort of way. Visuals: Buñuel clearly loved his surreal touches, and they are the best filmed moments of the movie. Since so much of the film takes place in a dim room, there is a sense of claustrophobia and increasing shabbiness that is not especially pretty on the screen, but it's effectively conveyed. Importantly, the casting, makeup, and wardrobe is sufficient to differentiate around twenty characters in an ensemble cast; with only a few exceptions, we are always able to keep track of the supporting characters without any difficulty at all. This is not always easy to pull off even in a color film, where a costume designer can color code characters with their clothes; since Angel is a black and white film, the feat is all the more commendable. Dialog: In Spanish, with English subtitles. Prognosis: I went into this film with trepidation, and was surprised to see it leaping immediately onto the shortlist of my favorite black and white movies. I am, I guess, a fan of fiction that departs from what-if questions: what if there was this party that people literally couldn't bring themselves to leave? It's the kind of premise that works well for, say, a Stephen King thriller; here, it's a premise that works well for a vaguely antiauthoritarion Spanish art film. The Exterminating Angel is not a fast moving film. I can't recall a single moment, in fact, that could be described as an "action scene." It's therefore (1) old, (2) black & white, (3) in English, and (4) based strictly on dialogue and atmosphere. Safe to say, it's not for everyone in the moviegoing American public. Me, I loved it. Maybe you'll like it too. It seems so wrong for there to be 0 comments about a Bunuel film--can it be because no one (certainly not I) can figure out how to spell Bunuel correctly, with the tilde? (I swear I know how to do this, but always forget when I need to do it.) Anyway, I liked this review--my criteria being that it made me want to see the film. Any advice on finding that tilde will be appreciated. I absolutely adore this film and in fact am including it in my Film Discussion Series of six films that I moderate at my public library. This is my second film screening series (the first theme was woman directors)and I'm excited for everyone to experience this great masterpiece. The Great Movies: "Gates of Heaven"